This is exactly what I needed, as I ending up doing the same as you. I can't believe that there is no command-line tool provided by Microsoft which allows you to delete a store if you accidentally create one. Thank you for pointing some of us in the right direction. I have a question: Have you ever tried to remove/delete a certificate store from the local machine instead of current user? 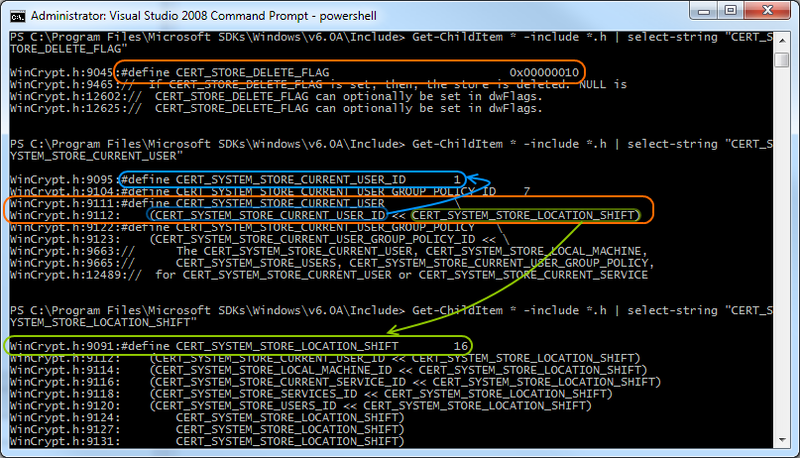 I managed to delete certificate stores from the current user but never from the local machine. 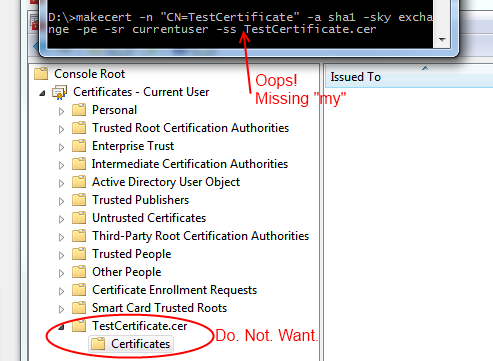 Curiously enough, the CertUnregisterSystemStore() call with (CERT_STORE_DELETE_FLAG | CERT_SYSTEM_STORE_LOCAL_MACHINE) ends up successfully every single time but without any effect! Michel I. Gallant (http://www.jensign.com/JavaScience/www/deletesystemstore/index.html) has a Java implementation where he seems to suggest that "Only deletion of CERT_SYSTEM_STORE_CURRENT_USER stores is enabled". I wonder if he refers to Windows or to his own program. MSDN does not state anything clearly in this matter. I had to run my little utility at an elevated administrative level in order to delete certificate stores from local machine. Arghhh... I should have been aware of this (not the first time it happens). Thanks for this wonderful blog and useful information. Thanks you saved me 20 mins/hours... who knows. This is exactly what I was looking for over endless hours. Thanks for another five hours worth of sleep for me!